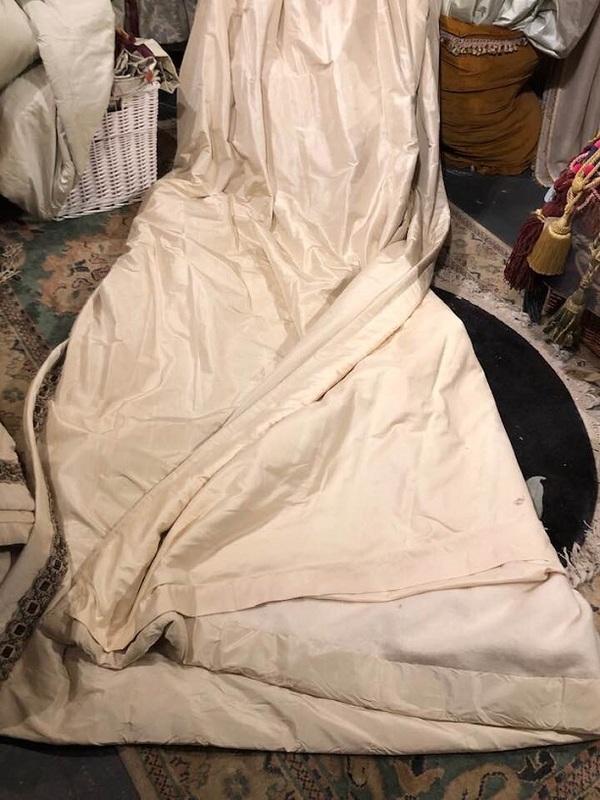 These fabulous pre-loved curtains are in excellent clean condition with no discernible marks and\/or stains to the fabric of the curtains and no noticeable fading to the leading edges of the curtains. The linings are in good clean condition with no stains, marks or fading due to the sun. These curtains are currently on display at our St Albans<\/span><\/b> showroom. The postage cost for these curtains, including Insurance, is \u00a328.50p<\/span><\/b> and are sent by UPS with delivery within 24 hours. Postage costs can be combined if more than one pair of curtains are purchased. Please contact us before paying for the curtains to obtain details of possible discounts available. If parcels are being shipped abroad you should contact us first to get details of additional costing over and above the UK rate applicable which we will invoice you separately and will need to be paid before the curtains are shipped out to you. 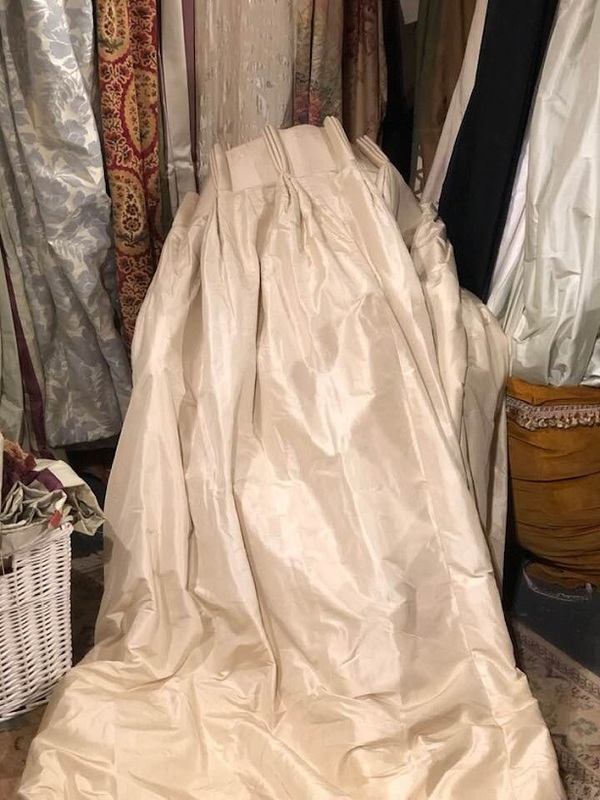 This listing is for a very lovely pair of cream silk pinch pleated and interlined curtains, one of 2 identical pairs available on this listing, in excellent clean condition. 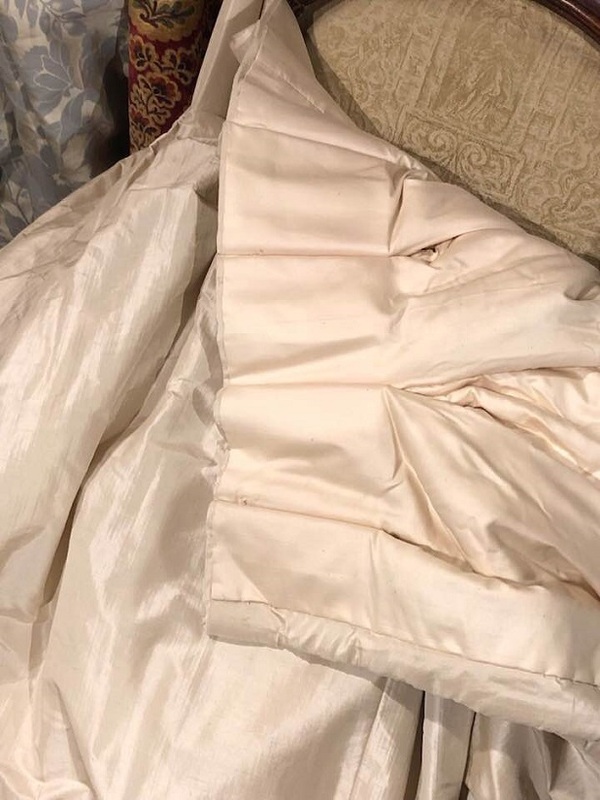 These fabulous pre-loved curtains are in excellent clean condition with no discernible marks and/or stains to the fabric of the curtains and no noticeable fading to the leading edges of the curtains. 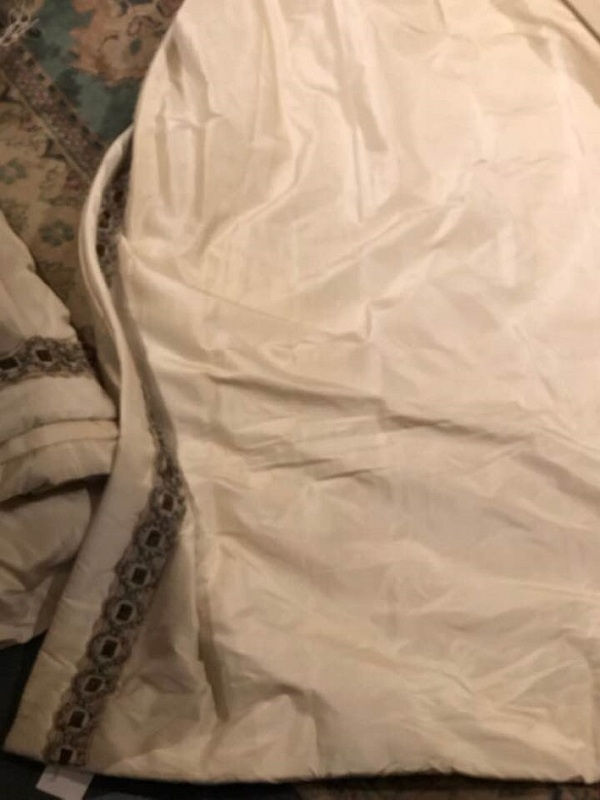 The linings are in good clean condition with no stains, marks or fading due to the sun. These curtains are currently on display at our St Albans showroom. There is a third pair available which would fit a window to 100 ins or 254 cms wide and the same drop as the pairs described above. However the workable drop for these, in their current condition, would be approximately 117 ins or 297 cms. 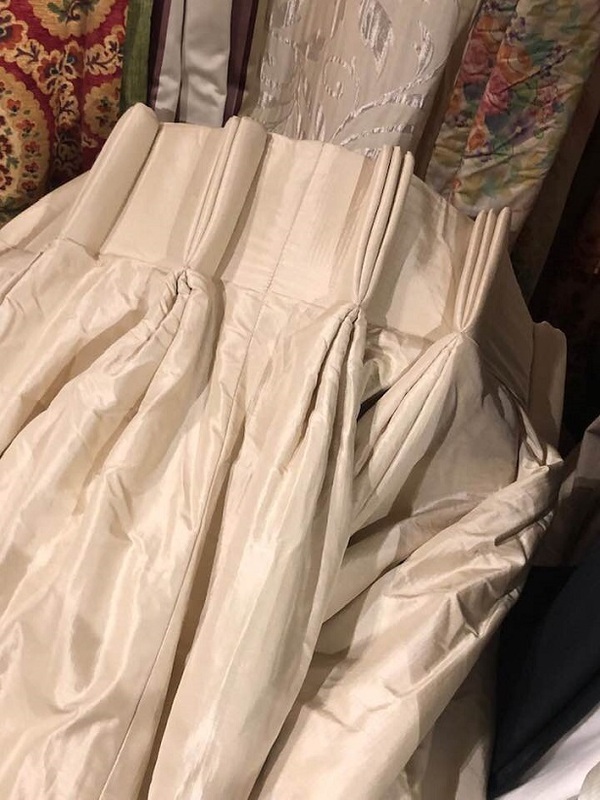 This is because there is water damage to the bottom 5 ins or 13 cms of the lining of one curtain which would really require the pair to be shortened by approx 6 ins or 16 cms approximately. 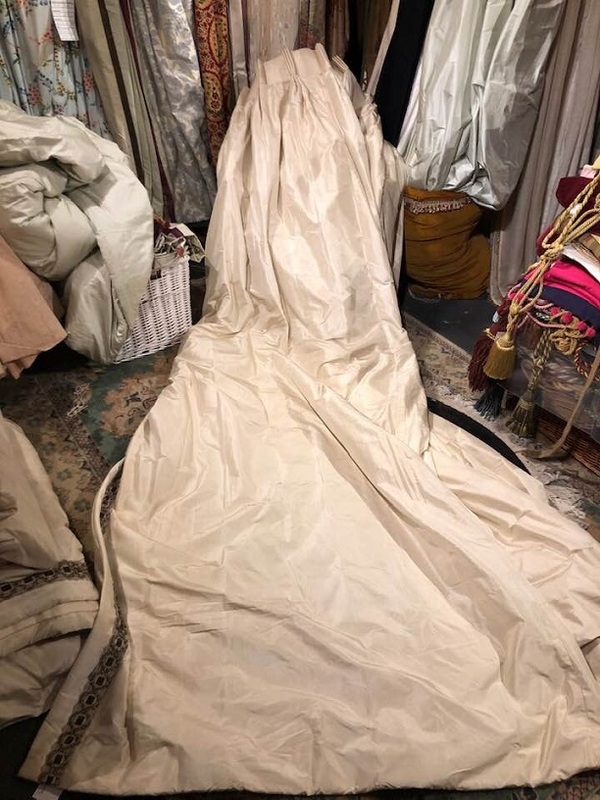 The postage cost for these curtains, including Insurance, is £28.50p and are sent by UPS with delivery within 24 hours.